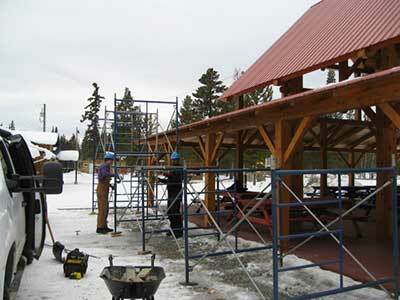 In the spring of 2014 while attending a Local Advisory Council (LAC) Forum, the Infrastructure Development branch of the Yukon government’s Department of Community Services gave a presentation on the Building Canada Fund. This federal fund focuses on a number of categories of infrastructure development, in particular, water and green energy, for which the Hamlet of Mt. Lorne could be eligible to apply for funding. Upon further discussion, it was determined that we could apply under these areas. I approached the LAC as well as the Lorne Mountain Community Association (LMCA) to see if they would support a funding application to get two green energy (solar) projects funded – one at the community centre and the other at the transfer station/dump, as well, to see if we could get a public water supply established in the Hamlet. At a meeting with the Infrastructure Development branch in February 2015, we presented our projects to them in the hope for future funding. 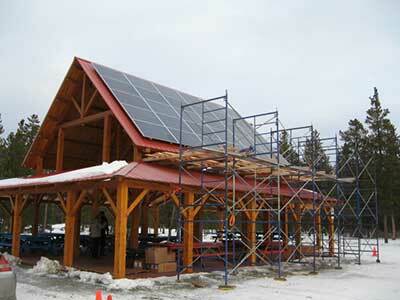 The project was proposed, based on 3 initiatives, offset some of the energy cost to run the community centre, act as solar demonstration project for Mt. Lorne and provide an educational project for students interested in renewable energy (Woods St. school experiential science program). We learned in September 2015, that the funding was allocated for the solar projects. A series of discussions were held over the following months to establish design criteria for the Community Centre solar project along with a Memorandum of Agreement between YG and the LMCA. The contract was let for the Community Centre project in February 2016 and installation began on March 4, 2016. Initially, the idea was to install solar panels on both the community centre roof as well as the outdoor timber frame pavilion. Both buildings had roof surfaces with good southern exposure. YG requires both building permit and electrical permit for the installation of a solar system on a building’s roof and in most cases will also require a structural analysis of the roof to ensure it can support the solar system. The community centre was built 25 years ago through volunteer effort, and though the roof was built using engineered trusses, none of the truss information could be found and it was felt the cost of the engineering analysis might be prohibitive. The timber frame pavilion’s structural information was still available and the original engineering firm that designed the structure agreed to do an analysis for us. The firm did the analysis for a 2.4 Kpa snow load (initially the structure had to be certified for 1.9 Kpa snow load in 2008). 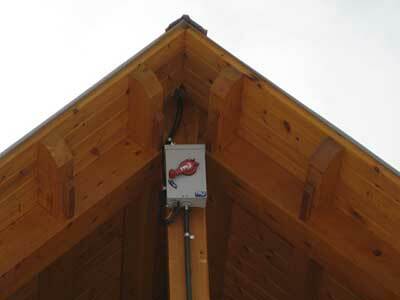 The analysis proved the structure was sound for the installation of the solar system, with the addition of some timber framing screws at several locations, which was completed during the installation process. 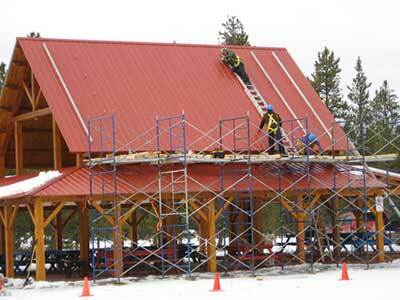 The pavilion’s roof is fairly steep and scaffolding plus a working platform were erected to facilitate the installation of the solar system. 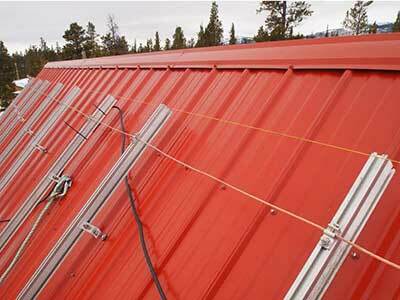 The rack mount system that will secure the solar modules to the roof was installed in a vertical orientation so that the mounting screws would fasten into the roof’s purlins. 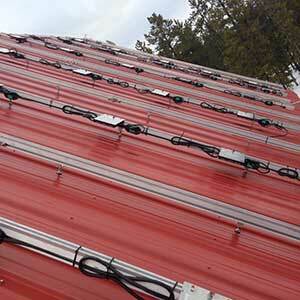 The modules will attach to the racking in a landscape orientation. 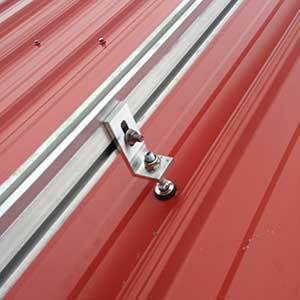 The racking system is all CSA approved and made of stainless steel and aluminium components. 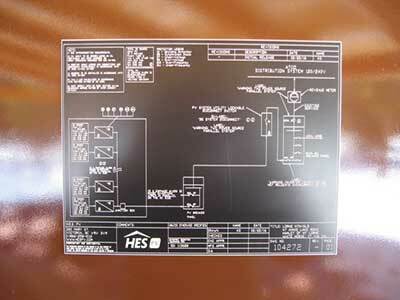 The mounting system had to be approved by an engineer to fulfil the building permit requirements. Once the racking system is in place, all the components must be bonded/grounded together. 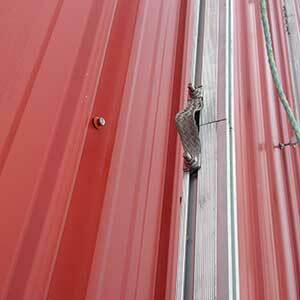 So each rail section and each vertical rail must be bonded together with suitable bonding. 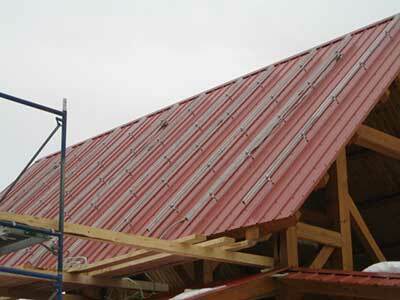 This solar installation is known as a grid tie system. What this means is that for the system to be able to produce power it requires that the system be attached to the electrical grid to energize the Microinverters. The inverters take the DC power from the modules and converters this to AC power. Each one of the solar modules in the system will have a Microinverter mounted underneath the panel, which the solar module then connects too. Each of the Microinverters are connected together and eventually they all connect to the breaker panel at the pavilion. 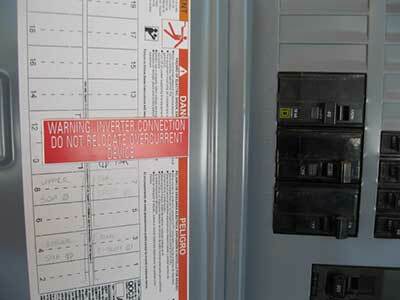 Electrical code has specific requirements for mounting the Microinverter (grounding) and securing the connecting cables. Once the inverters and connecting cables are secured to the racking rails, the solar modules are connected to the Microinverter and then secured to the racking. The frame of the module must be grounded to the racking rails, usually by the use of a special grounding washer (Washer Electrical Equipment Bonding (WEEB)). 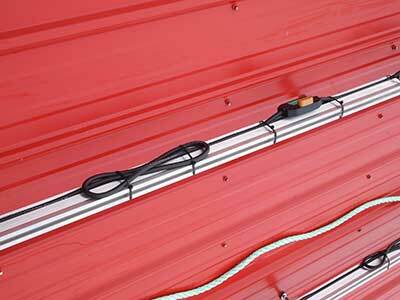 The bolts/clamps holding the solar module frames to the rails should be torqued to manufacturers specifications. Next is the power cable from the solar array to the building’s breaker panel. Specific cable ratings are required for the power line. You are also required to have a disconnect within 10 ft. of the solar array and another one just before connection to the breaker panel so that the system can be disconnected from the grid, in case of an emergency. 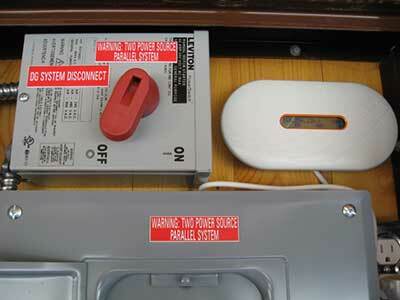 Special labelling is required indicating the components related to the solar system as well as circuit diagram of the solar system. For this installation we also installed a monitoring module to allow us to track the power production of the system as well as help us monitor the Microinverters in the system. The final step in this project is to apply to the Micro Generation program http://www.energy.gov.yk.ca/microgeneration.html to get the ability to sell back any surplus energy the system produces to the grid. To be able to do this we had to pass the final building and electrical (service) inspection, prior to making the application. 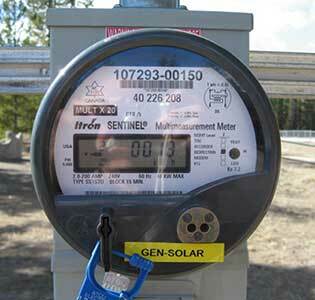 Once the application is approved ATCO Electric will install a bi-directional meter at the service pole. The meter measures the power the community centre consumes as well as what it sends back to the grid. We will also have a web based monitoring site, where you can see what power the system is producing. The Bi-Directional meter provides 4 screens of information. Screen 1 – Kwh delivered to customer, Screen 2 – Kwh received from the customer (solar output), Screen 3 – Max. Watt demand and Screen 4 – Max. VA demand. The values presented on the screens must be multiplied by 20 to give the true total values being recorded. Sow’s Ear Renewable Energy was the contractor for the installation of the solar project. If you have any questions about the Mt. 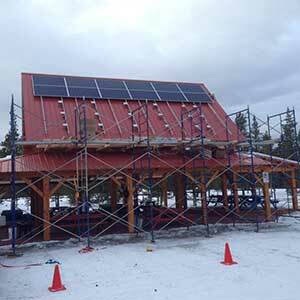 Lorne Community Centre Solar Project, please contact Al Foster, Lorne Mt. Community Association. This was a volunteer-initiated project in support of our community. Volunteering your time and ideas can benefit our community. Give it try, you might be amazed with what you can accomplish.